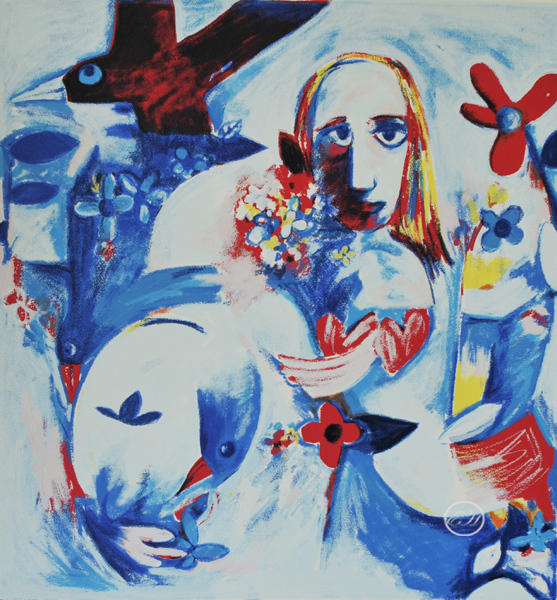 This Charles Blackman limited edition Silkscreen print titled Alice’s Adventures is from the Alice series released in 2001, the image size is 67x63cm – the sheet size is 105x75cm, we believe the series is sold out other than stock we have. Other titles are Chess Game, Pink Alice, Alice’s Jug, White Rabbit, Always Tea Time. Charles Blackman the Alice paintings, made in the mid 1950s, are some of his most important works. Charles Blackman’s acclaimed series of Alice paintings came about after listening to the classic Lewis Carroll book in taped form with his sight-impaired writer wife, Barbara. The impact of his discovery of Alice in Wonderland coincided perfectly with his readiness as an artist. What attracted him to Alice, he recalled, was that once you go through the mirror, everything is possible. It had to do with my feelings about femininity and the fact that scale, size and relationships were altered… It is his Alice in Wonderland series of pictures that are now highly expensive collectors’ items. Alice Series Charles Blackman the Alice paintings, made in the mid 1950s, are some of his most important works. Charles Blackman’s acclaimed series of Alice paintings came about after listening to the classic Lewis Carroll book in taped form with his sight-impaired writer wife, Barbara. The impact of his discovery of Alice in Wonderland coincided perfectly with his readiness as an artist. What attracted him to Alice, he recalled, was that “once you go through the mirror, everything is possible. It had to do with my feelings about femininity and the fact that scale, size and relationships were altered…” It is his Alice in Wonderland series of pictures that are now highly expensive collectors’ items.